One of the most recognizable birds in the world is the snowy owl. Their white plumage and yellow eyes are very unique and distinctive. Snowy owls are among the few birds that make the north their year round home. These majestic birds have been used on currency and stamps throughout the world. They have also made their way into fiction and into popular culture. They are probably the most powerful of all the owls. The snowy owl is also known as the great white owl or the arctic owl. A fully grown snowy owl can have a wing span of 125 to 150 cm. They stand about 50 to 63 cm in height, and weigh between 40 60 oz (1100g to 1600g). Wild owls will live an average of 9 years whereas captive owls have been known to live for 35 years. The snowy owl is the official provincial bird of Quebec. These birds are protected in Canada. A group of owls is called a parliament. A clutch refers to a group of eggs laid by an owl. Snowy owls will have between 2 and 11 eggs in one clutch. Snowy owls are considered to be diurnal. They hunt both at night and during the day. Snowy owls make their nests on the ground. The owl will make their nest in a small depression in the ground. They will line the nest with their own feathers and grass. The Inuit call these birds, ookpik. Snowy owls live primarily on rodents and lemmings. Mating season for snowy owls begins in March. During the mating season males will strut, puff themselves up and drag their wings on the ground to impress females. Males may even hold kills in their beaks in their efforts to attract a female. Owls will often stay together for life. The owls are very careful not to leave their eggs unprotected. The male will guard the female and the young chicks. Any threat to the nest will be met by aggressive behaviour, by both the male and the female. They will dive bomb predators and attempt to lure them away from the nest. Harry Potter’s owl is a female snowy owl named Hedwig. The snowy owl is most commonly found in the northern regions of Canada. However, snowy owls have been sighted as far south as Tennessee. These birds can stay year round in the north or they may migrate south. Migrating owls tend to leave the northern region around November. There is even speculation about whether or not some of these birds travel to Russia. 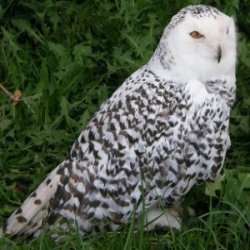 This entry was posted in Animal Trivia and tagged arctic owl, arctic owl trivia, owl facts, owl trivia, Snowy Owl, Snowy Owl facts, Snowy Owl Trivia, tundra owl, tundra owl facts, tundra owl trivia by Jane. Bookmark the permalink.